Born in Montana, Chuck attended Lodge Grass High School in which he “Lettered” in basketball, baseball, track, and rodeo all 3-years. It was rodeo in which he excelled and in 1950 was the Montana High School all-around champion, in both timed and rough stock events. A member of the University of Arizona Rodeo Team in 1956-57, Chuck started working as a bullfighter and rodeo clown for Kirby Hughes Rodeo Stock Contractors. He spent years working his way up to the top level of his profession, traveling at his own expense to over 50-rodeos a year. He has worked every big time rodeo in the United States and Canada. He was elected the National Finals Rodeo clown in 1968 and 1971. He was the first clown to serve as board member of the Professional Rodeo Cowboys Association in 1974. 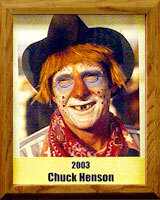 Hoof and Horns Magazine named Chuck its first Rodeo Clown of the Year in 1978. In 1995, Chuck became the first, and only cowboy from Tucson, elected to the Rodeo Cowboy’s Hall of Fame. Although he has lived and worked out of Tucson for over 50-years, Chuck was elected to the Montana Sports Hall of Fame. Chuck served as the Grand Marshall of the Tucson Rodeo Parade in 1990, and the 2003 Grand Marshall, Larry Mahan, one of the greatest “All-Around” Rodeo cowboys in history, credits Chuck Henson with saving his life in his first Tucson Rodeo appearance. He help start and run a rodeo program for the Special Olympics, that has become a popular feature of many rodeos, including the National Finals Rodeo each year. When the rodeo comes to towns all over the country, Chuck will put on his clown outfit and visit children in hospitals, making them laugh.